I was looking to follow up the 100 day challenge with another minimalist clothing experiment and wanted to try something that encompassed the full wardrobe. And something that was a bit more realistic for others to attempt. 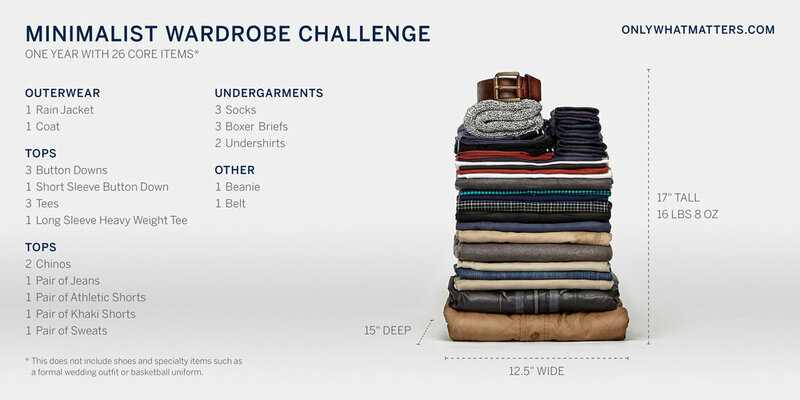 The year long minimalist challenge started with the selection of 26 core items that I would wear for the entire year. (I had some event specific items such as basketball gear, cycling bib/jersey, snowboard pants, and a wedding suit that I did not count in the core item total.) And unlike the 100 day challenge, washing my clothing was allowed. If you are looking at this and thinking, either this guy is lying or has a completely different lifestyle than most people, let me explain. I don't have the typical office job. I work from home, but I'm generally not lounging around in sweats and a t-shirt. I have in-person meetings throughout the week that require a professional look, so I normally dress for the entire day depending on my schedule. I like to do at least one active thing each day which normally involves playing basketball, biking, or jogging. Aside from not seeing the same people each day in the office, I imagine my lifestyle isn't too dissimilar from many of you. This is obvious, but spend some time thinking about what you want to wear for a year. A month in to the experiment, I wanted to take back some of my choices. I was stuck with two unattractive items:sweats and rain jacket. Prior to starting the minimalist challenge, my favorite pants were stretch khaki chinos. They look good paired with a t-shirt or a button down and they are light and comfortable. However, as winter rolled around (and the Portland rain, sigh), I found myself reaching for the denim seven times out of ten. Compared to the chinos, the jeans held their shape better, hid dirt better, and generally looked more presentable after multiple wears. If my jeans had stretch, they’d probably be more comfortable, but they would have required washing to tighten them back up after the elastic stretched out. If you can’t wear jeans, look for a heavier weight chinos with mechanical stretch. We all have a shirt or a pair of pants in our closet that we don’t wear for one reason or another. The denim that I referenced above is a perfect example. I was accustomed to a stretch denim but for some reason, I selected my selvage jeans (that I rarely wore) to be one of three pants for the following year. My rational at the time was, I only wear chinos, so I’ll rarely wear these jeans, but they could be nice to have. As noted above, they became my go-to pant. Why don’t more people do this? Sewing on a loose button or patching a hole is an easy at home DIY project. And if you can't figure it out, take the garment to a tailor for $15. Most of the wear and tear on a garment is from cleaning. If you can reduce the heat and friction during cleaning that’s a start. If you can reduce the number of times you have to clean something, that’s even better. If you rotate between three button-down shirts, people don’t notice or care. And if they do notice, who cares! Chances are that they will ask for tips on cutting back on their wardrobe. Choosing what to wear takes less than 15 seconds. Even with a wide variety of events and activities, your options are just limited. It’s quite refreshing. During the last few months, the novelty of the year-long minimalist wardrobe challenge wore off a bit. I missed the creative freedom of fashion. Going into the year-long challenge, I expected unforeseen functional shortcomings with my selected wardrobe, but the creative displeasure with limited wardrobe options surprised me. Start with what you currently have in your closet. Don’t go run out there and buy all the “minimalist clothing” you can find. Check out our private community. You'll get the support and accountability needed as you start your own minimalist challenge journey. Newer PostWhat does the community discuss?